Magical Dining Month is almost here! Make reservations now to secure a spot in Orlando’s most anticipated dining event of the year. Every night, from August 25th to October 1st, you can visit one of the 80 participating restaurants around Orlando for a prix fixe 3-course meal at only $35 a person. 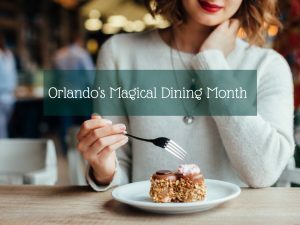 Best of all, a dollar from each meal ordered during Orlando’s Magical Dining Month will be donated to two local charities, so eat up! With all the great options available, it can be overwhelming to come up with a plan on where to eat, especially when multiple people are involved. Luckily, we’ve made a list of things to consider in order to help your magical dining experience go smoothly. Pick a Cuisine – If your party is struggling to decide where to eat, it is wise to resolve what kind of food everyone wants. Choosing a particular cuisine will help you narrow down the 80 restaurants you can choose from. If not a specific cuisine, maybe revisit an old favorite. Try Something New – For the more spontaneous, we recommend picking a restaurant at random. When the price isn’t an issue, you have more freedom to choose (randomly or intentionally). If you are a lover of all types of cuisine, this is your chance to visit a restaurant you might not have gone to otherwise. So be adventurous! Use Your Resources – The official website of Magical Dining Month offers useful resources designed to help you discover new restaurants and understand the specifics of the event. Featuring a list of all participating restaurants that you can categorize by location and cuisine, this site makes it easy for you to pick a restaurant your whole family will enjoy. Upon arriving, be sure to tell the restaurant that you will be participating in the Magical Dining Month menu. The site also highlights the charities that will receive donations from the event, and the FAQ page should help answer any questions you may have. Take Your Time – Why not make a vacation out of it? Many of the restaurants participating in this event are located near the attractions, so scoop up your family or friends and spend the week exploring Orlando’s dining scene and theme parks. With so many things to do in the Orlando area, you will want to stay near the action. Less than ten minutes away from attractions like Universal Orlando Resort™ and the Orlando Eye, staying at Rosen Inn means you won’t be far from some of the top entertainment in the country. To check availability or book your room, call us today at 407-996-1600.